South Africa’s Maroesjka Matthee (third from left) won the Africa Cup Elite Women road race in Eritrea recently. She is pictured here (from left) with teammates Zanri Rossouw, Liezel Jordaan, and Sanet Coetzee. 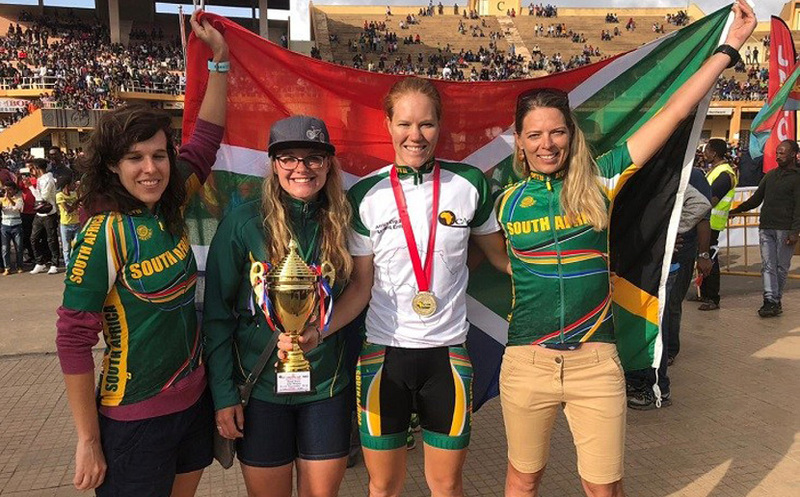 South Africa’s Maroesjka Matthee, who won the Africa Cup road race in Eritrea recently, praised the country for the manner in which it hosted the event and treated women cyclists. “The women have the same equipment and support as the men. It was great to see equal opportunities for both genders,” said Matthee. She added that it was a wonderful experience to race against other African countries. Matthee said the hospitality in Eritrea was “incredible” and everyone was friendly and helpful. She added that she “absolutely fell in love” with the place and that it was a happy country. Eritrea is a small state on the Red Sea coast wedged between Sudan and Ethiopia. “There’s respect for each other. There are so many people on bikes. Racing there is unbelievable. Everyone comes out in support; thousands of people. It’s really amazing,” said Matthee. The 29-year-old said it was an “awesome feeling” to win the road race and that it was an unexpected result. She added they were lucky to encounter near perfect terrain and weather conditions, as it rained two weeks prior to their arrival. Matthee’s teammate Sanet Coetzee, who won the criterium the day before, crashed twice during the race. “I was right behind her and swerved out when she crashed. It felt like everything went in slow motion as I saw her fall,” said Matthee. A challenge for Matthee was that she was sick the week before departing for Eritrea and was worried it would hamper her performance. “I was very frustrated as I’ve had a bad year health-wise. I couldn’t believe I would get sick again at yet another crucial time. “We were informed that Asmara was 2 300m above sea level, so I knew breathing would be somewhat of an issue. That was my biggest challenge as I felt through the week’s racing I couldn’t push myself to physical exhaustion as my lungs kept me from doing that.